I know. The entire blogging world is displaying cakes, cookies and desserts of the best kinds and here I chose to speak about a salad, right? But lately, this is what I have been making a lot of, thanks to pomegranates being available in the stores in truck loads. Besides, Mr. K (that’s one of his endearments) loves when I pack this salad for his lunch. Handy lunch according to him, along with a bottle of protein shake to wash it down with. BTW, quite a many years back, this salad was on my wedding menu as well. That’s a food memory story I promise to share another day. Wait. There’s more to this post. Something that might get you excited about! There’s a lot I want to talk about Himalayan Pink salt. But, for this post, all you need to know is that I am smitten by its color and I will be forthright in saying that, that’s what got me to buy it in the first place. So pretty in pink, ain’t she? Oh! The exciting part.. Shall come to it right away.. I have a GIVEAWAY to share with you. The lovely people at Zinio are offering not one but a generous 10 FREE magazine subscriptions to share with you – my dear readers, to help get the word out about their holiday discounts. There’s no catch – no trial offer or credit card number required. Join Just Homemade on Facebook and leave a separate comment to let me know you did so. Follow @justhomemade on twitter and leave a separate comment to let me know you did so. Tweet about this giveaway including my twitter handle @justhomemade and leave a separate comment to let me know you know did so. ** 10 Winners will be chosen randomly and announced in this post later. Winners will be contacted by email for information about first, last name and magazine title of choice. Be sure to include a valid email address while posting comments. If the winner fails to respond within 48 hours, a new winner will be chosen. Thank you for reading. I would love for you to stay in touch with me on Facebook, Twitter, and Pinterest. And, if you like what you read, why not Subscribe to Just Homemade and never miss a post? Disclosure: Zinio is providing 10 free magazine subscriptions to give away to our readers and I have not been compensated separately for this. All opinions are my own. Winners will be emailed with the details on how to claim their subscriptions. Wash the green grams well and soak overnight in plenty of water. Next morning, drain the water, give it a good rinse and wrap soaked mung beans in wet paper towels or soft cotton/cheese cloth. Place it in a big enough bowl, cover with a lid and let sit in a draft free warm spot for a day or two until well sprouted or about 1 cm. In winter, just pop it into the oven and let it sit there for a day or two, no preheating required. For the seasoning, heat oil in a small kadai or skillet. When the oil is really hot and shimmering, add the mustard seeds. Oil is hot enough when the mustard seeds start spluttering as soon as you add them. Now add hing and green chillies and sauté until the chillies turn a pale white. Switch off and keep aside. If using pink salt, grind coarse salt in a mortar and pestle for it to dissolve easily. 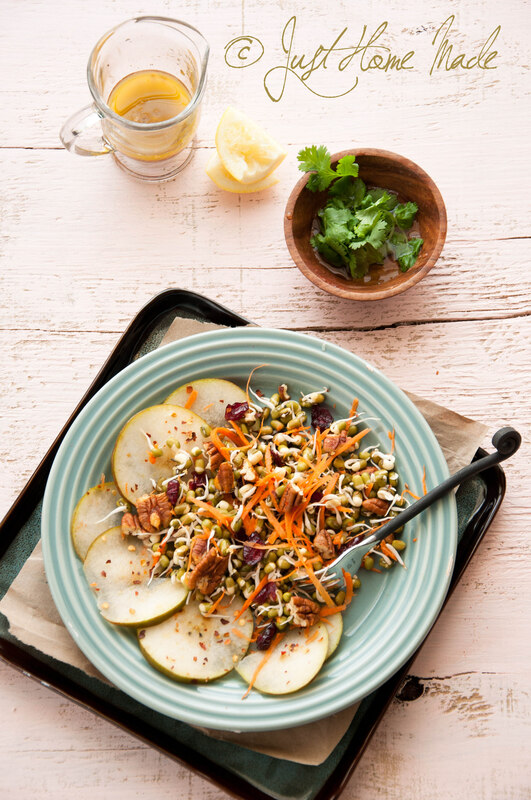 In a mixing bowl, toss in mung sprouts, pomegranate arils, grated coconut and sultana raisins optionally. Add the tempering, garnish with chopped cilantro, sprinkle some pink salt, squeeze some lemon juice and toss well to mix. Then, go grab your fork! Tastes best served fresh immediately after preparing. Because Pink salt is expensive, I buy from a reputable brand sourced by fair means from TJ Maxx or Marshalls at bargain prices and tend to use it occasionally. Sprouted Mung is not only healthy but the Pomegranate is sweet! All the 5 tastes! Yum! I would like to see your blog continue just the way it is right now, not just in 2013 but forever! I love the look of that pink Himalayan salt. Now I need to check here in stores if I can get hold of it. before I press the comment submit button, let me wish u a very Happy holidays, Radhika! I have been following you for a while now, both in Twitter and FB! And now I have tweet about the giveaway too! I love salads and like the idea of combining all the different tastes into one dish! In 2013, would love to see more salad recipes and also recipes which include sweet, salty, tart and hot ingredients in one dish! I would love to see more of you lovely desserts! Happy holidays! Beautiful post. I love the pretty pinks….Himalayan salt, the glass, NICE! Also love the platter in the first picture. I love the refreshing light look of the salad, and look forward to seeing more similar ‘Fresh’ stuff here. This is a great giveaway. Will be a difficult choice if I win. Happy Holidays Radhika!! Thanks for the invite to be a part of this giveaway. 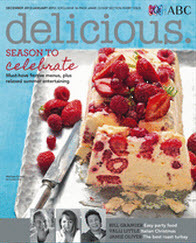 Who doesn’t love magazines with beautiful food photography? And before I leave, Seasons’ Greetings to you and family and happy holidays too. Simple but deliciously flavoured dishes, something you can make without much effort. I love the light you capture in pink himalaya salt! For 2013 I would like to recipies that make you happy offers us. Looking forward to more of your healthy recipies. Anything that is fast and vegetarian. I work over 40 hours every week and its always challenging to cook something healthy and fresh every evening. Lovely post and pictures and a great giveaway! I like that amidst all the dessert stuff going around the holiday season you chose such a healthy recipe to share.and since all my new year resolutions start with I want to lose weight, would love to see more of such recipes in 2013! Beautiful looking salad! I would love to see some traditional South Indian sweets and savory dishes! Such a fantastic and generous giveaway. Just right for the holiday mood. THanks so much for hosting this giveaway and giving your readers the opportunity to participate. I would love to see more salad recipes like the one you have posted here. Post the new year binge, some simple, flavoursome salads feel like a refreshing change. I have also tweeted about this fantastic giveaway! Nice Pictures. The pink salt is my favorite. Hope to see Authentic Karnataka cuisines from you. What a wonderful giveaway! I have been exploring a lot of salt. My most common one so far is Mediterranean sea salt and Himalayan salt. You have such magic in your hands and that shows in your pictures. They are gorgeous! Hope I win this giveaway 🙂 Happy Newyear Radhika. Looking forward more lovely post and opportunity to interact and grow our friendship. I would love to see more sprouted bean recipes because I am trying to incorporate more of them in my diet. Thanks! A beautiful looking dish which I am sure tastes as good as it looks! I have just started using pomegranates and sprouted beans so the timing is great. 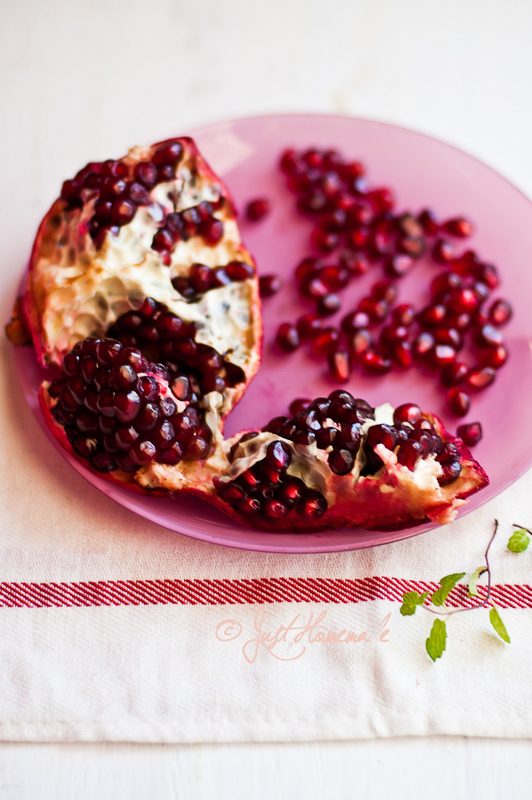 I came across a lovely recipe for a pomegranate dressing that I will post and I bet this would be delicious incorporated. I use a lot of grains in my cooking, but would like more recipes for Spelt grains and Barley. Continued good luck with the blog and best wishes for 2013. Hey!! Happy New Year! Would love to see many more authentic, healthy foods along with some baked stuff as well… Cheers! Radhika, thank you for your New Years greeting and the offer for a magazine subscription. I have ‘liked’ you on Facebook to enter the contest. Your photographs here are beautifully done. Wow, the pink salt! Thank you also because in reading the comments, I was led to another blog–one about Indonesia–and from there to one about history. So now I am very happy–I have three new friends to start this new year. Happy New Year to you and your family! Happy New Year! In 2013 I’d love to see lots of recipes with shaved vegetables. They just look so appetizing in photos and they’re good for salads, sandwiches or pastas. Even as a garnish on the side with a main dish just to add some colour would be nice. A very Happy and Prosperous new year 2013. I love your blog and the receipes. I would love to see your blog going on forever. I would love some eggless baking and healthy dishes for our daily menu. what would I like to see more of in 2013.. more seasonal recipes that work with fresh produce… your blog is always a delight to read!! I already subscribe to your mails.. Happy 2013!! I whish you and your family a fantastic new year!! A beautiful salad! So appetizing, tasty and healthy. Happy New Year Radhika. Hope you had fun holidays. All the best for 2013. What a lovely giveaway! I would love to win few subscriptions! I think my first comment didnt go through! Just wanted to wish you a Happy New Year and a lovely 2013. Hope you had fun holidays!! I would love to win some subscriptions through your lovely giveaway!! I think I would love to see more of dry south indian stir fry or curry recipes. Happy New Year Radhika. I really love what you are doing now. Please continue to blog the recipes that sings in your heart and makes you feel good as a person. I am already following you on Twitter and Facebook. Happy New Year and lovely blog you and recipes you have. Love your photography and hoping to see more salad recipes..
What a great giveaway! I’d say your blog is wonderful just as is. However, some traditional Indian recipes would be lovely. Liked you in FB a while ago! ooh! stumbled on to your blog and loving it already! will be back to check it out leisurely. want to leave a word about our blog too – Aalayam. Lovely Post and Beautiful pictures. Thanks for letting me know about this giveaway Radhika. Would love to see more easy to do recipes in 2013 with your gorgeous photography. Lovely pictures!! In 2013 I would like to see recipes of baked appetizers using healthy ingredients! I think it would be interesting to apply Ayurvedic doshas(pitta, vata, kapha) to your recipes. Give folks a chance to understand their doshq constitution type is and how food is used to balance them. And, Thank you to each one of you who for making this a success and for your great suggestions on recipe type! Loved reading them all. I will be putting in extra efforts to post more traditional recipes like many of you pointed out. Beautiful pictures, Radhika. You know what would be a perfect addition to this recipe. Its what Kannadigas call congress(spiced peanuts). Sadly, I haven’t found it in any store here. Of course! Congress Kadlekai would be an awesome addition..